Jim DeMint is quitting the senate to run a think tank. Sen. Jim DeMint (R-S.C.) speaks during CPAC on Feb. 9, 2012, in Washington, D.C.
South Carolina U.S. 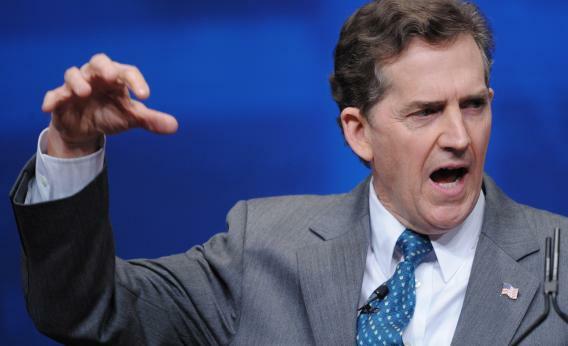 Senator Jim DeMint will replace Ed Feulner as president of the Heritage Foundation. Mr. DeMint will leave his post as South Carolina’s junior senator in early January to take control of the Washington think tank, which has an annual budget of about $80 million. There were four full years left in DeMint’s term—he had pledged to retire in 2016—so this comes as a shock to everyone outside DeMint’s and Fuelner’s offices. Maybe we should have seen it coming. Earlier this year, DeMint set loose the Senate Conservatives Fund, the inside-outside Republican PAC that encouraged conservatives—and even to primary moderates—to run. He blew a few races, but he succeeded in marshalling through a group of reliable, energetic, media-savvy conservatives, like Mike Lee, Rand Paul, Ted Cruz, and Marco Rubio. DeMint was the first to talk down his own political skills and talk up the people he’d recruited. His work here was done. One irony: DeMint was an early endorser of Mitt Romney’s 2007 campaign. At the time, he cited the Massachusetts health care law as a crucial reason for the endorsement. That health care law was inspired, in part, by the work of Heritage health care researchers. Now, DeMint will probably help Heritage become a leading voice for Obamacare dismantlement. He made $174,000 in the Senate; in 2010, Fuelner made $1.1 million from Heritage. So that’s a plus, too. UPDATE: DeMint’s announcement is here.